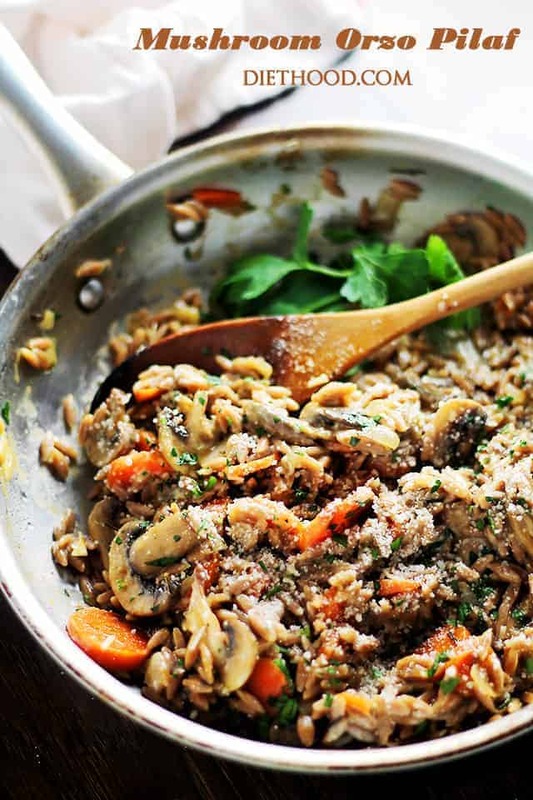 Mushroom Orzo Pilaf is a quick, creamy and delicious one-pot pilaf with orzo and mushrooms. An easy mushroom recipe your family will love! Now. THIS is my kind of eating delicious vegetarian. It’s also the kind of delicious that you eat straight from the pan, burning your tongue and all, because it’s so darn good!! Heya! What’s going awn’? How’s your week so far? Fingers crossed, you all have great news to share! For me, because it’s been gloomy and rainy, the good news to share is that I’ve caught up on all the things that have been chillin’ on my DVR. “Secrets and Wives” might be my new addiction. Also ALSO?? $100 GIVEAWAY! It’s been a while! I hope YOU win! One more good piece of news? I have also learned how to use artificial lights to take food pictures for ya even when it’s dark and moody outside! What do you think? Do they look good? I HOPE! Let me know! By the way, because of the gloomy mood… and expiring mushrooms…. 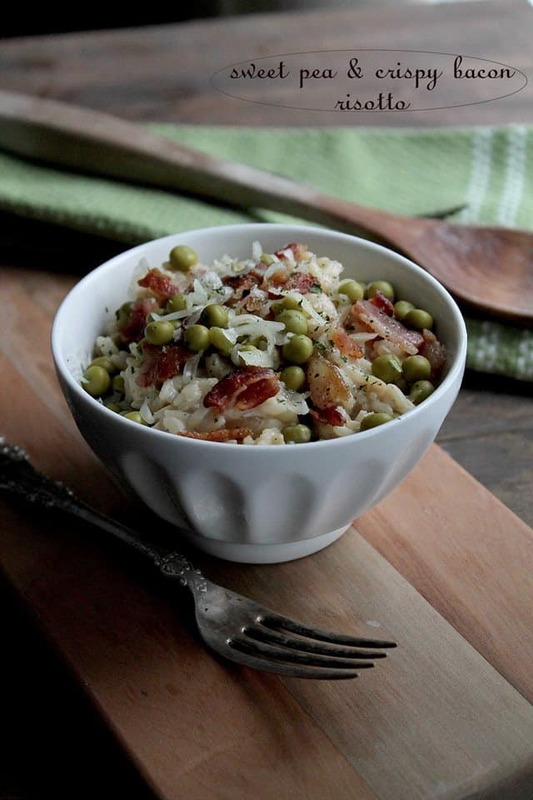 and comfort food, I made us pilaf: warm, creamy, damn delicious pilaf with orzo! Whole Wheat Orzo, at that! 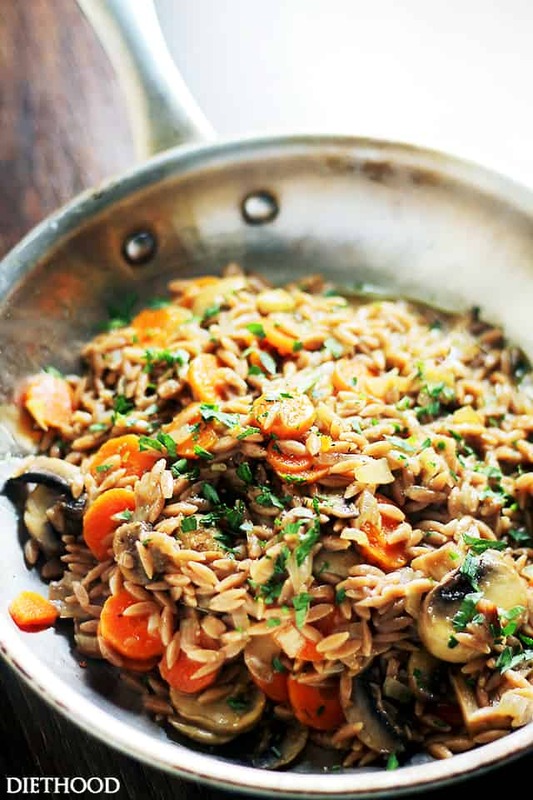 This pilaf is based on some of my favorite pilaf and risotto meals that my mom makes. IF there’s a person that knows how to make a mean pilaf AND risotto the right way, that’s my Mama. It’s like WHOA! I’ll have her “make” it for you and I one of these days and share her secrets, and exhausting mixing and stirring that comes with all that good food. BUT, because you and I like (and need!) shortcuts, there’s very minimal mixing involved here and it all takes place in one pan, in under 30 minutes. HIGH FIVE! The dreamy creaminess here is what really counts. And it’s earthy. And filling. Looking for something warm and meaty to go with it? Hmmm… chicken! Fish. Tofu! More veggies? Play with it, you can’t go wrong! P.S. SCROLL DOWN AND ENTER THE GIVEAWAY! 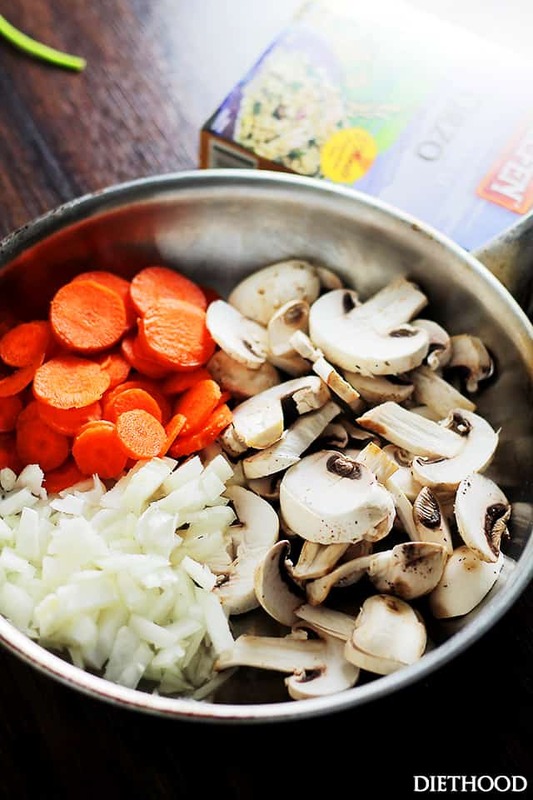 Add diced onion, mushrooms, carrots and season with salt; cook, stirring occasionally, for 5 to 7 minutes, or until veggies are tender. Stir in minced garlic and continue to cook for an additional 30 seconds. Add orzo, rosemary and vegetable stock; stir and bring to a boil. Reduce heat to a simmer and cover with a lid; continue to cook for 10 minutes. Garnish with grated parmesan cheese and serve. I actually made this dish last night to accompany scallops for New Year’s dinner and it was very good!!! Will make it again! OK – I HAVE NOW PRINTED THE LAMB DISH AND THE SAUSAGE DISH AND THE MUSHROOM DISH. WHEN AM I GOING TO HAVE TIME TO DO ALL THIS AND WHO IS GOING TO EAT IT ALL – WILL HAVE TO CALL IN THE NEIGHBORS. I’M DOING OSSO BUCCO FOR EASTER DINNER AND I’LL DO THE MUSHROOM RISOTTO. Yay for artificial light! They look fantastic! What did you end up getting? I just got the Lowel Ego light and loving it but it is definitely a learning curve! I love risotto! I too wich it didn’t require so much work. 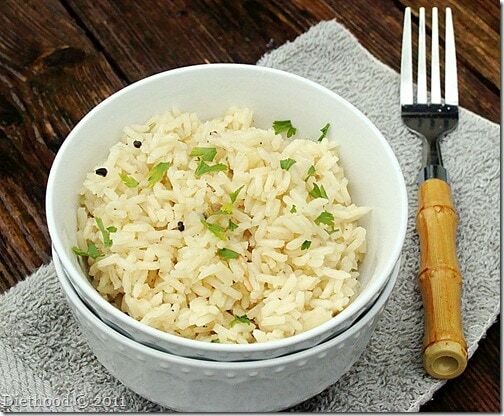 Your recipe with orzo is genius! I love the mushrooms! Great recipe. I know all about burning my mouth by eating straight from the pan. Photos are great with your artificial light. OOoooh! This looks super yummy! Oh this looks totally amazing! And your artificial lights are officially the bomb! I’ve been wanting to invest in some for a long time. Mushrooms NEED to be in a vegetarian dish to make me not miss the meat. Gah, that makes me sound terrible but. yeah. Love orzo and this sounds like something worth burning my tongue for! Booo on the rain but your artificial light is looking great! I would have never guessed! 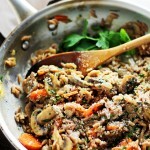 And of course this mushroom orzo pilaf looks amazingggggg! Oh wow I just love all things mushroom – this would be a fantastic dinner!! Girl, this is totally my kinda dish! I big puffy heart mushrooms! Can’t wait to make this! Pinned for sure! I love mushrooms and this looks super tasty! Katerina … this is the perfect side dish any time of the year. 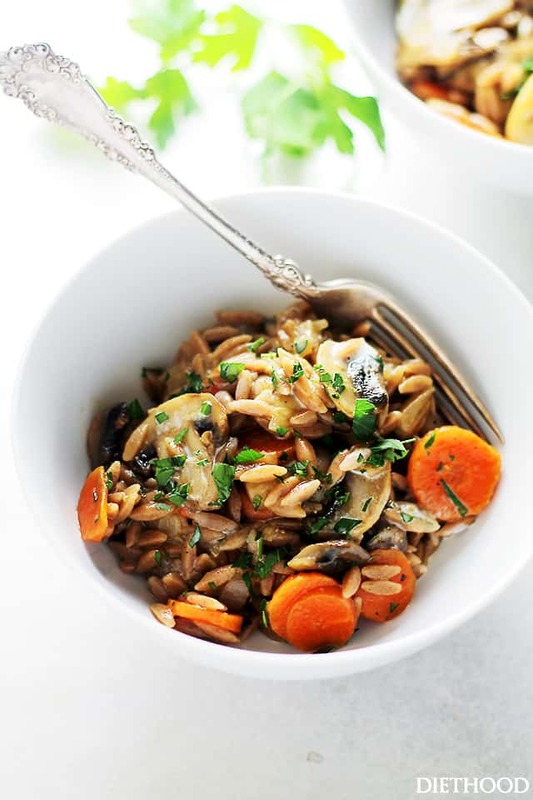 I love mushrooms in pasta and the addition of sweet carrots must great great flavor. Pinning this one for sure. I have some orzo sitting in my pantry right now that I was debating how to use it. I think this recipe is the winner! Thanks for sharing!